supporting all concerned stakeholders facing the PD through e-learning access. 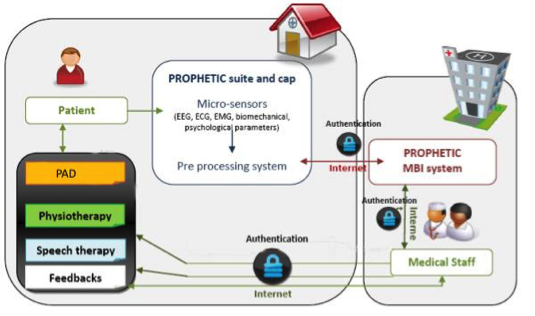 In particular, the PROPHETIC system will make use of wearable electronics (suite and cap) capable of performing regular measurements of neural, physiological, and biomechanical parameters and communicating them after pre-processing (Pre-Processing system) in a secure manner to a Medical Business Intelligence System (MBI system). 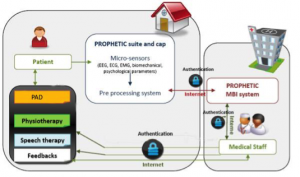 At this level, the pre-process data will be further process (data fusion, analysis and interpretation) hence overcoming existing limitations relevant to real time activity monitoring. 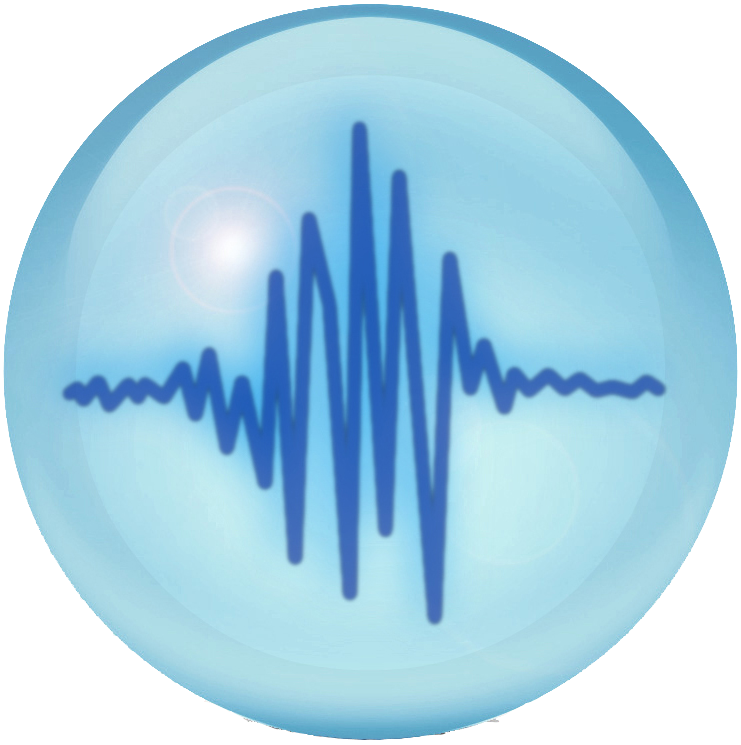 Continuous monitoring of the aforementioned parameters while aware of the patient medication (dose schedule) will help determine in real time its health and motor status, avoid medication side effect such as dyskinesia (abnormal involuntary movement) and other symptoms or adverse events like freezing, law blood pressure, nausea … , falls. This valuable clinical instrument should support caregivers’ decision and allow early treatment interventions (adjustment of the medication, physical therapy, speech therapy). Hence by the means of a friendly technology (i.e. smart phone or PAD) appropriate information could be shared between all the protagonists (medical staff, family, and concern person) with restricted access taking into account their status.